President, Voices for National Service; Chief Strategy Officer and Executive Vice President, City Year, Inc.
Last month, 75,000 new AmeriCorps members were sworn in to serve in communities across the country, pledging to do what they do best: use their energy and talents to improve communities, impact lives, and tackle some of the biggest challenges facing our nation. 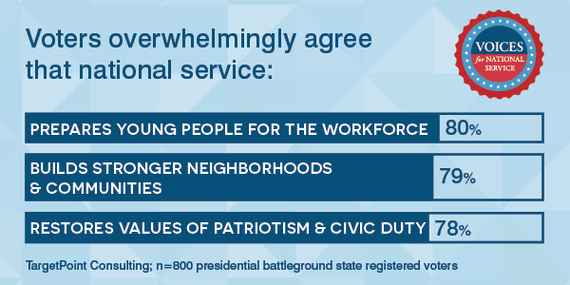 AmeriCorps has enjoyed a long tradition of bipartisan presidential support from President George H.W. Bush to President Clinton to President George W. Bush to President Obama. 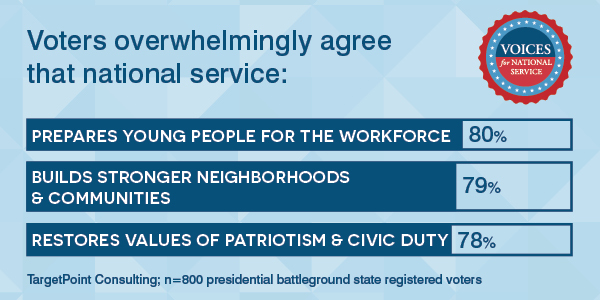 Those of us on the front lines have always known that national service is something that Americans can all agree on, and now there is new evidence to back that assertion up. 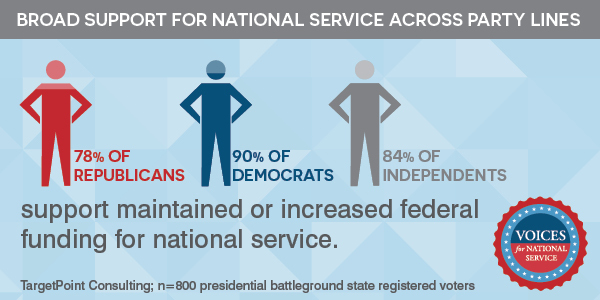 A new poll by TargetPoint Consulting asked voters in nine battleground states about their views on national service and the response was clear: 83 percent of voters want Congress to maintain or increase the federal investment in national service. This includes 90% of Democrats, 78 percent of Republicans, 84 percent of Independents, and 78 percent of Tea Party supporters. Importantly, only 12 percent of Republicans and 14 percent of Tea Party supporters want to cut all funding for national service programs. Each of these constituencies overwhelming agreed -- by better than 4 to 1 margins -- that such an investment yields important gains for the country, including preparing young people for the workforce, building stronger neighborhoods and communities, replacing government handouts with local, volunteer-based, community work, and empowering people to be more self-sufficient and less dependent on the government in the long run (AmeriCorps members earn a college scholarship worth $5,775, helping them to meet the ever-rising costs of college tuition). What's more, 67 percent of voters polled said they are more likely to vote for a presidential candidate who came out with a plan to provide an AmeriCorps member to all low-performing schools in America to be tutors and mentors, and 61 percent of voters are more likely to vote for a candidate who would guarantee funding for all qualified national service applicants. Despite this support, AmeriCorps and Senior Corps are in real jeopardy. The U.S. House and Senate Appropriations Committees are considering dramatically reducing the federal investment in the Corporation for National and Community Service (CNCS), the federal agency that administers AmeriCorps. The proposals being considered would reduce AmeriCorps by up to 25,000 positions, meaning significantly fewer local "boots on the ground" to strengthen education from preschool through college, help communities recover and rebuild after natural disasters, support veterans and military families, combat poverty, assist seniors in independent living, and build economic opportunity for individuals and communities. The American people have faced the threat of national service elimination before, and we have won. We've won because the infusion of high-impact, cost-effective people power brings help, hope, and, most importantly, results to communities across our nation, leveraging private support and community volunteers along the way. The bang for the buck is compelling and badly needed: economists in this Columbia University study estimate that every dollar invested in national service generates almost $4 returned to society in higher earnings, increased output, and other community-wide benefits. 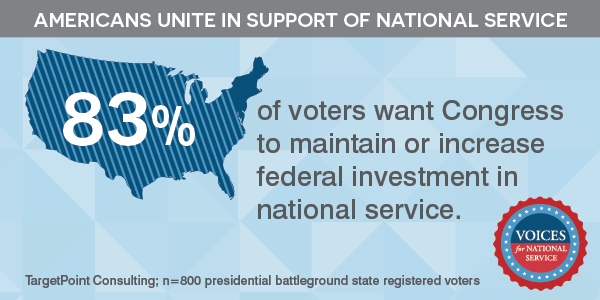 So as our members of Congress debate the merits of investing in national service and as presidential hopefuls unveil more details about their plans for the country's future, they should know that a commitment to increasing the funding for national service is not just one that resonates with voters across the political spectrum -- it's one they actively want.